Junior Software developer builds and works on grading software systems in an organization and is also involved in various areas from designing, development to testing. 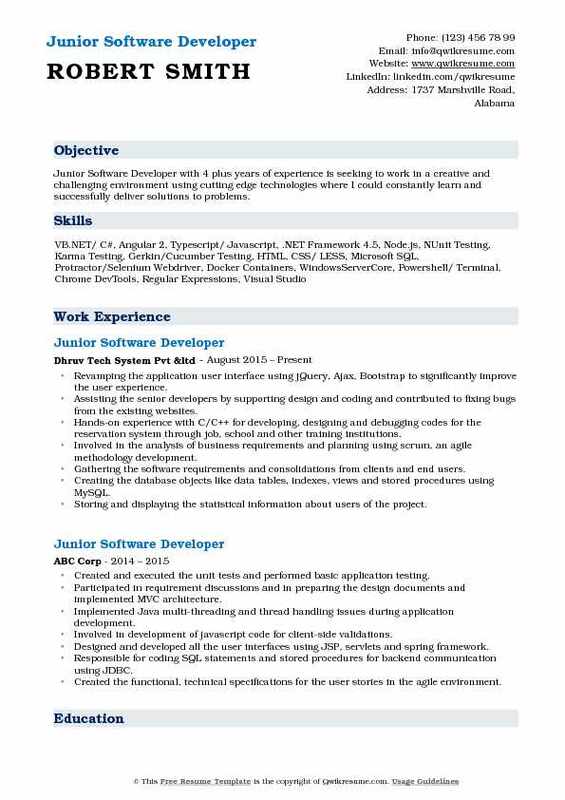 Junior Software developer roles and responsibilities can be projected as follows – working with developers to design software, algorithms, flowcharts and applications; producing clean and efficient specifications, integrating software components, verifying and deploying systems and programs, troubleshooting and upgrading existing software, debugging errors, gathering and evaluating feedbacks, executing improvements, assisting in creation of technical documentation for reports and references. 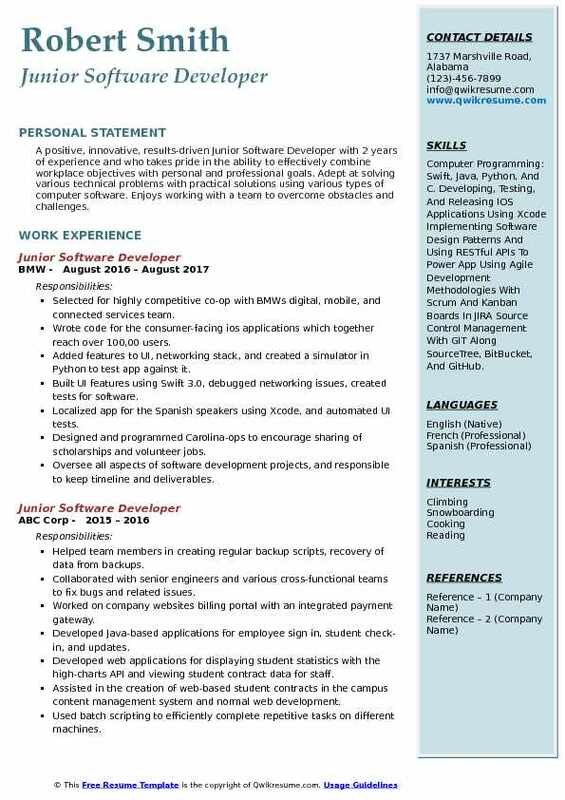 Summary : Junior Software Developer III with 8 years of experience in the IT domain is seeking to pursue an opportunity with a growing organization that will utilize and enhance my knowledge in software development, and that will provide me with essential growth opportunities. Participating in daily scrum meetings, sprint planning, unit testing and bug fixes. Developing and maintaining a reporting system for support users, managers and executives to keep track of support calls both on a moment to moment basis and over time using PHP, MySQL, HTML, and CSS. The menu maintenance portal is a web-based system that allows users to manage all of the settings for each of their restaurants in one place. In charge of all content deployment for digital menu boards and management training systems. Working closely with the QA and Product Management teams as well as other developers to ensure quality and punctual software development. Troubleshooting server communication and any potential Cron, SMTP or POP3 issues. 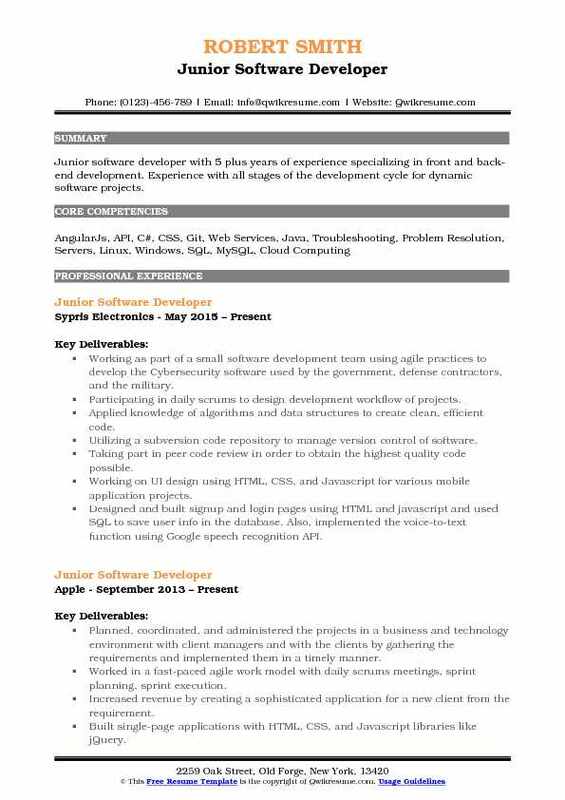 Objective : Junior Software Developer with 3 plus years of experience in the Engineering domain is seeking to apply and expand my knowledge and skills towards working in a collaborative environment to develop quality software solutions that address and solve business problems. Implemented access database that used a form in which a client would input data into fields to store entries into a database that was used to track inventory of aircraft parts. Performed troubleshooting of software solutions in sharepoint, console, and other tools used for development. Communicated and worked with clients to discuss and determine requirements to implement software solutions that fit their business needs. Developed the android application that captures "selfies" and converts them into personalized emojis. Implemented in Android studio using the Android SDK interface with native java. Challenges included integration of the apps components, becoming accommodated with a new development environment, and managing conflicting ideas within the team on the vision for the final product. Assisted in the development of a website for a non-profit alliance to graphically show and analyze data. 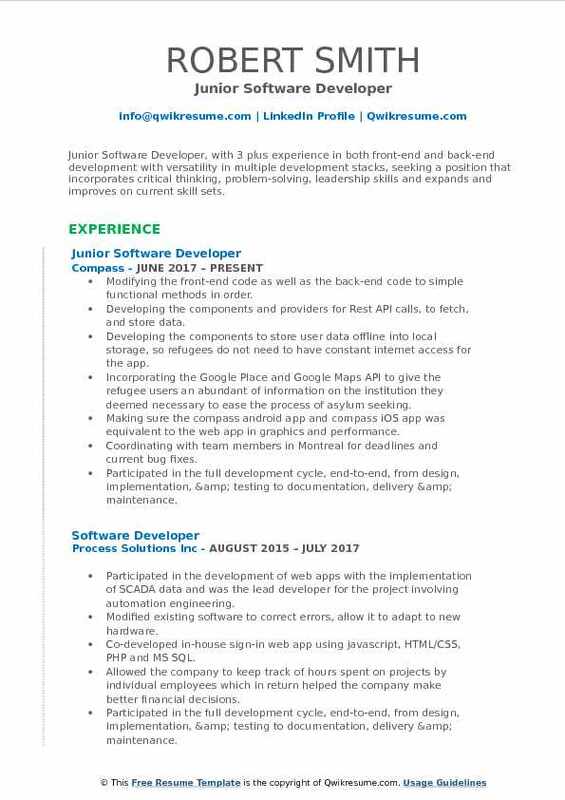 Objective : Junior Software Developer with 2+ years of experience in the Technology domain looking for a development position. Supportive and enthusiastic team player dedicated to efficiently resolving project issues. 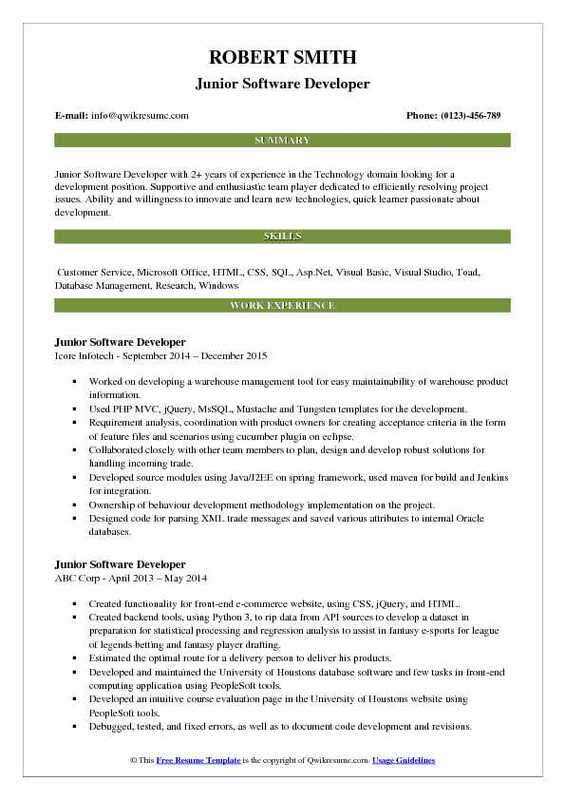 Ability and willingness to innovate and learn new technologies, quick learner passionate about development. Worked on developing a warehouse management tool for easy maintainability of warehouse product information. Used PHP MVC, jQuery, MsSQL, Mustache and Tungsten templates for the development. Requirement analysis, coordination with product owners for creating acceptance criteria in the form of feature files and scenarios using cucumber plugin on eclipse. Collaborated closely with other team members to plan, design and develop robust solutions for handling incoming trade. Developed source modules using Java/J2EE on spring framework, used maven for build and Jenkins for integration. Ownership of behaviour development methodology implementation on the project. Designed code for parsing XML trade messages and saved various attributes to internal Oracle databases. Worked on transfer adapter, parsing trades, wrote maintainable and extensible code in java. Used SOAP web services to retrieve last modified file from the pod's simulator. Worked with the QA team and learned BDD and technologies used for its implementation. 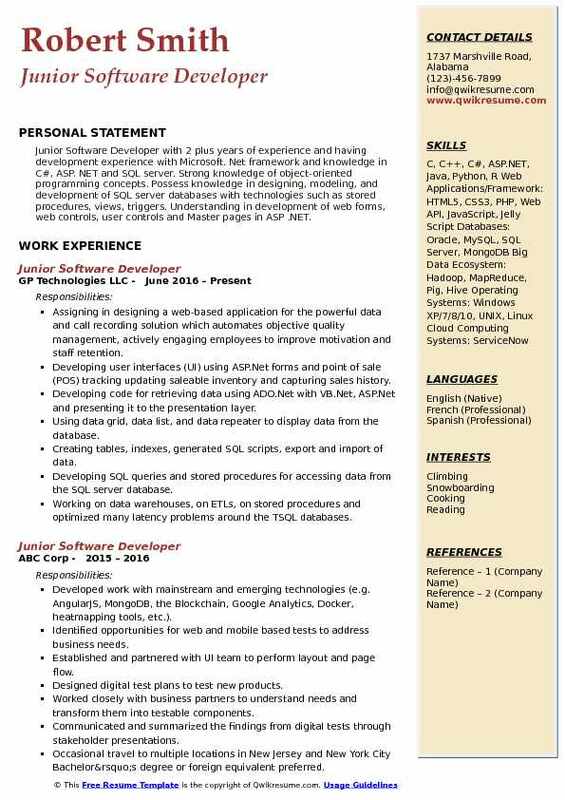 Objective : Junior Software Developer, with 3 plus experience in both front-end and back-end development with versatility in multiple development stacks, seeking a position that incorporates critical thinking, problem-solving, leadership skills and expands and improves on current skill sets. Modifying the front-end code as well as the back-end code to simple functional methods in order. Developing the components and providers for Rest API calls, to fetch, and store data. Developing the components to store user data offline into local storage, so refugees do not need to have constant internet access for the app. Incorporating the Google Place and Google Maps API to give the refugee users an abundant of information on the institution they deemed necessary to ease the process of asylum seeking. Making sure the compass android app and compass iOS app was equivalent to the web app in graphics and performance. Coordinating with team members in Montreal for deadlines and current bug fixes. Participated in the full development cycle, end-to-end, from design, implementation, & testing to documentation, delivery & maintenance. Objective : A positive, innovative, results-driven Junior Software Developer with 2 years of experience and who takes pride in the ability to effectively combine workplace objectives with personal and professional goals. Adept at solving various technical problems with practical solutions using various types of computer software. Enjoys working with a team to overcome obstacles and challenges. Skills : Computer Programming: Swift, Java, Python, And C. Developing, Testing, And Releasing IOS Applications Using Xcode Implementing Software Design Patterns And Using RESTful APIs To Power App Using Agile Development Methodologies With Scrum And Kanban Boards In JIRA Source Control Management With GIT Along SourceTree, BitBucket, And GitHub. Selected for highly competitive co-op with BMWs digital, mobile, and connected services team. Wrote code for the consumer-facing ios applications which together reach over 100,00 users. Added features to UI, networking stack, and created a simulator in Python to test app against it. Built UI features using Swift 3.0, debugged networking issues, created tests for software. Localized app for the Spanish speakers using Xcode, and automated UI tests. Designed and programmed Carolina-ops to encourage sharing of scholarships and volunteer jobs. Oversee all aspects of software development projects, and responsible to keep timeline and deliverables. Objective : Junior Software Developer with 4 plus years of experience is seeking to work in a creative and challenging environment using cutting edge technologies where I could constantly learn and successfully deliver solutions to problems. Revamping the application user interface using jQuery, Ajax, Bootstrap to significantly improve the user experience. Assisting the senior developers by supporting design and coding and contributed to fixing bugs from the existing websites. Hands-on experience with C/C++ for developing, designing and debugging codes for the reservation system through job, school and other training institutions. Involved in the analysis of business requirements and planning using scrum, an agile methodology development. Gathering the software requirements and consolidations from clients and end users. Creating the database objects like data tables, indexes, views and stored procedures using MySQL. Storing and displaying the statistical information about users of the project. 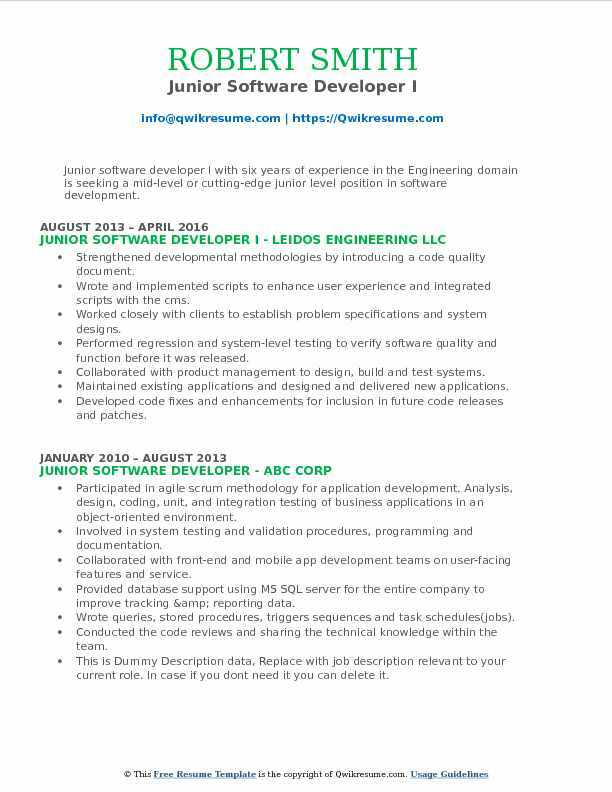 Headline : Junior software developer I with six years of experience in the Engineering domain is seeking a mid-level or cutting-edge junior level position in software development. Performed code review, work close to the team member to ensure consistency to code standards. 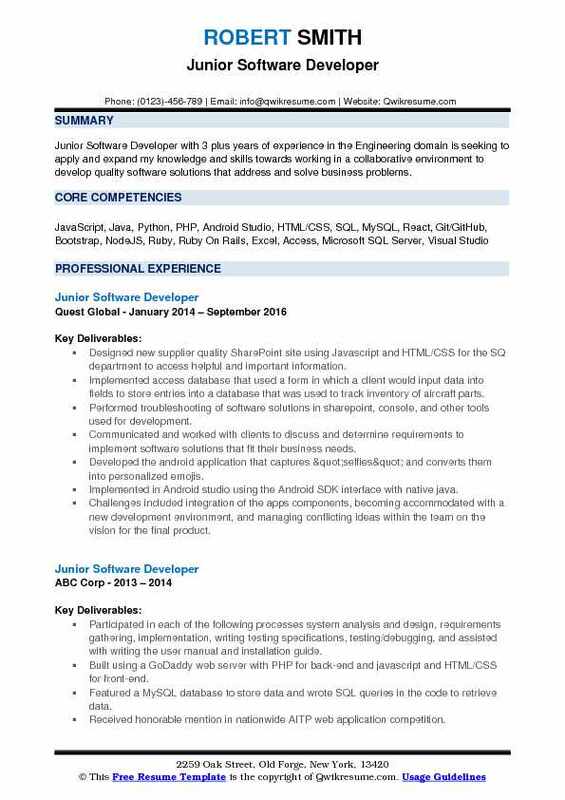 Headline : Junior software developer with 5 plus years of experience specializing in front and back-end development. Experience with all stages of the development cycle for dynamic software projects. Working as part of a small software development team using agile practices to develop the Cybersecurity software used by the government, defense contractors, and the military. Participating in daily scrums to design development workflow of projects. Applied knowledge of algorithms and data structures to create clean, efficient code. Utilizing a subversion code repository to manage version control of software. Taking part in peer code review in order to obtain the highest quality code possible. Conducting a/b test to optimize checkout funnel and increase conversion rate. Designing, developing and optimizing the SQL database tables, stored procedures, views, and triggers. 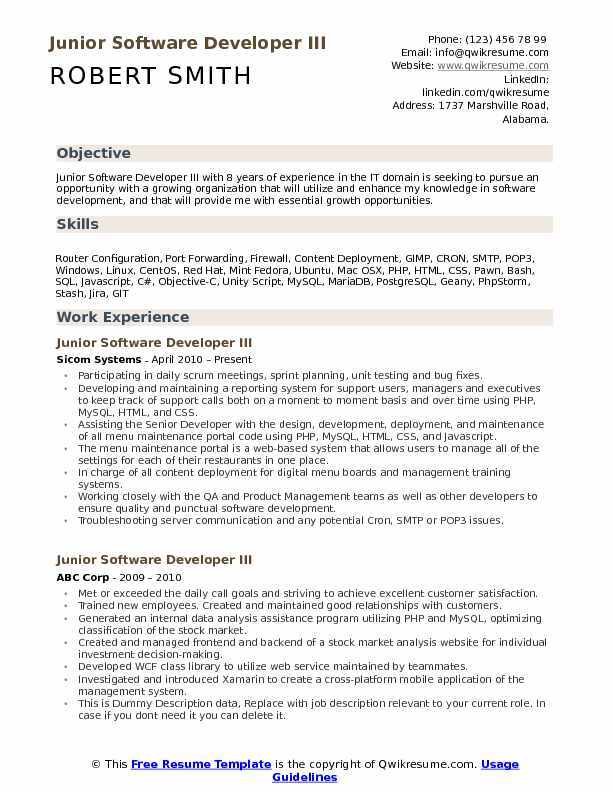 Objective : Junior Software Developer with 2 plus years of experience and having development experience with Microsoft. Net framework and knowledge in C#, ASP. NET and SQL server. Strong knowledge of object-oriented programming concepts. Possess knowledge in designing, modeling, and development of SQL server databases with technologies such as stored procedures, views, triggers. Understanding in development of web forms, web controls, user controls and Master pages in ASP .NET. Assigning in designing a web-based application for the powerful data and call recording solution which automates objective quality management, actively engaging employees to improve motivation and staff retention. Developing user interfaces (UI) using ASP.Net forms and point of sale (POS) tracking updating saleable inventory and capturing sales history. Developing code for retrieving data using ADO.Net with VB.Net, ASP.Net and presenting it to the presentation layer. Using data grid, data list, and data repeater to display data from the database. Creating tables, indexes, generated SQL scripts, export and import of data. Developing SQL queries and stored procedures for accessing data from the SQL server database. Working on data warehouses, on ETLs, on stored procedures and optimized many latency problems around the TSQL databases. 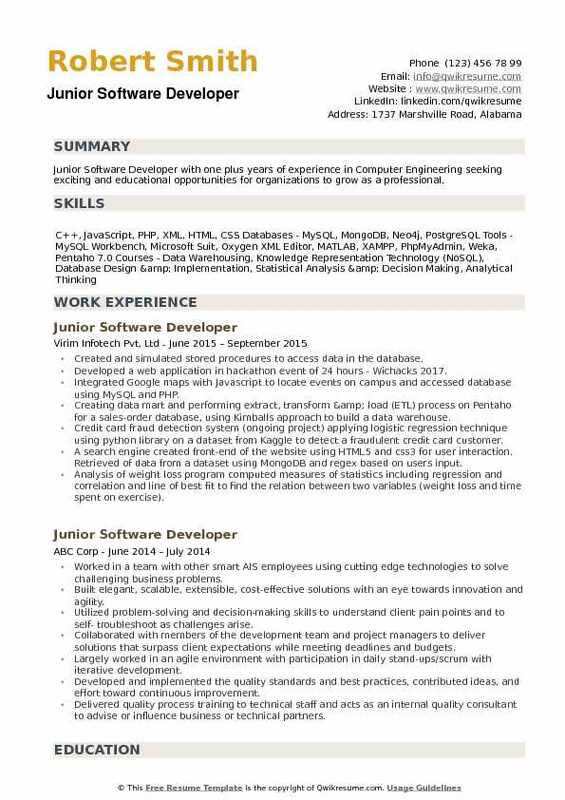 Objective : Junior Software Developer with one plus years of experience in Computer Engineering seeking exciting and educational opportunities for organizations to grow as a professional. Created and simulated stored procedures to access data in the database. Developed a web application in hackathon event of 24 hours - Wichacks 2017. Creating data mart and performing extract, transform & load (ETL) process on Pentaho for a sales-order database, using Kimball's approach to build a data warehouse. Credit card fraud detection system (ongoing project): applying logistic regression technique using python library on a dataset from Kaggle to detect a fraudulent credit card customer. A search engine: created front-end of the website using HTML5 and css3 for user interaction. Retrieved of data from a dataset using MongoDB and regex based on users input. Analysis of weight loss program: computed measures of statistics including regression and correlation and line of best fit to find the relation between two variables (weight loss and time spent on exercise). Recipe- displayed three recipes using XML, XLS, HTML5/CSS3 and oxygen XML editor.